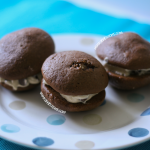 Soft, tender Chocolate Chip Muffins filled with an oozing Biscoff spread centre! A decadent breakfast, or a tasty dessert? You decide! Oh yes, I went there. 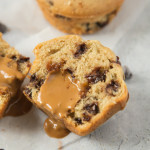 I made my favourite base muffin recipe (that I posted like years ago…) and dropped 2 heaping teaspoons of Biscoff spread into the centre of each one before baking them up into quite possibly the best muffin I’ve ever made. 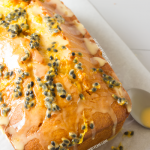 Who knew such simple flavour combinations create the best bakes? Although seriously, my addiction to Biscoff spread is getting out of control. Maybe it should have been my New Year’s resolution to eat less Biscoff… Or not. I mean, it is amazing! Especially in the centre of these chocolate chip muffins. 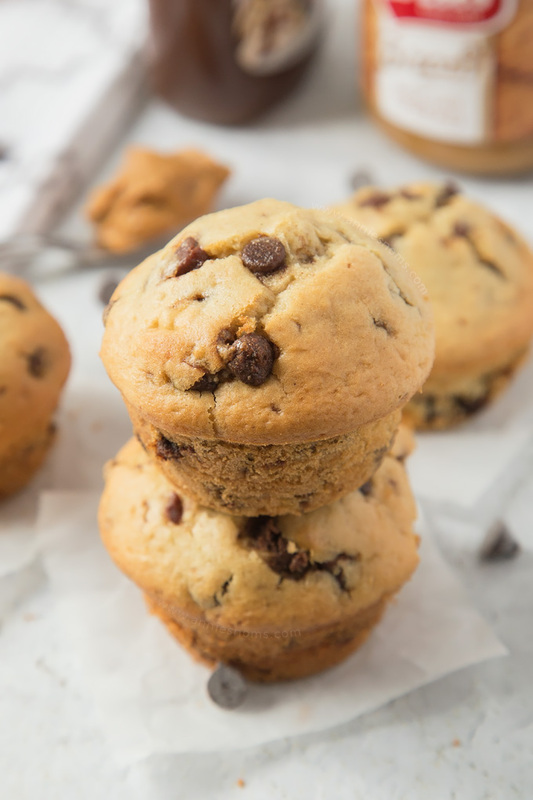 Now, I developed my base muffin recipe over 3 years ago and I’ve created countless gorgeous variations of it over the years, but I realised the other day, that I’ve never actually shared the base recipe for chocolate chip muffins. Haha, I get so carried away with creating all these amazing flavour combinations that I sometimes forget about the classics. 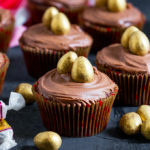 The best thing about these muffins is that you don’t need a mixer, just a bowl, spoon and a jug for the wet ingredients. These muffins are literally amazing. The most perfect texture and flavour ever and the less you mix them, the better they are. There’s no beating with my muffin recipe, you just want to mix the ingredients together so there are no lumps of flour visible and you’re done. 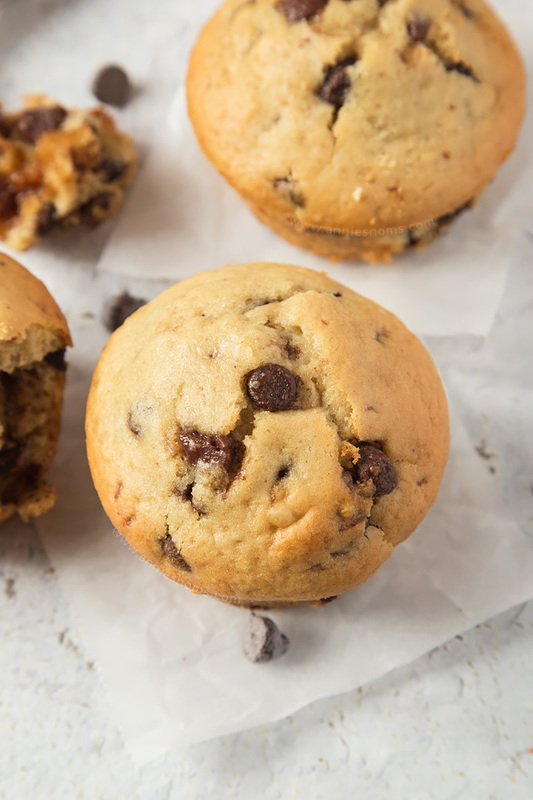 To make the Biscoff centre, I placed 1.5tbsp of the muffin batter into a muffin tin sprayed with cooking spray, then I spooned in the Biscoff… whilst obviously eating some too… then I topped that Biscoff carefully with another 1.5tbsp of chocolate chip muffin batter. Mmmmmhmmmmm. Tip time: I would really advise using a 1.5tbsp cookie scoop/ice cream scoop, I found it much easier to ensure the Biscoff was encased by batter having a level cookie scoop of batter and then placing it directly on top of the Biscoff, so it fell around it. The first time I made these chocolate chip muffins with the Biscoff centre I was a little apprehensive over how the centre would turn out. But, this is why we have the process of developing recipes, so we can make them again and again until they are perfect! And this is why I share my recipes with you, warts and all… so that you don’t make the same mistakes I’ve made! I can’t stand shady people. Like if you’re going to steal my recipes, change the amounts of one or two ingredients and then pass it off as your own… that’s not cool… Anyway, enough about that. That’s my philosophical Tuesday out of the way… now who mentioned that these muffins are ready in under 40 minutes…? Preheat the oven to 180C/350F and spray a 12 hole muffin tin with cooking spray. 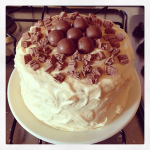 I used Wilton Bake Easy. Place flour, chocolate chips, baking powder, bicarb, salt, sugars and cinnamon into a large bowl and stir briefly until all of the chocolate chips are coated in flour. Place cooled butter, vanilla, eggs and milk into a jug and beat lightly with a fork until combined. 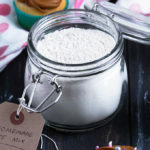 Pour your wet ingredients into your dry and then stir just until you can see no more lumps of flour, don't be tempted to beat the batter otherwise the muffins will be rubbery. Using a 1.5tbsp cookie scoop, place level scoops of batter into each muffin hole. Spoon 2tsp of Biscoff into the centre of each muffin, really try to make sure it's in the centre. Spoon another level 1.5tbsp of muffin batter direcelty over the top of the Biscoff, so the batter falls around and over the Biscoff. The muffin holes should be filled about level. Place in the oven for 15-20 minutes, until risen, lightly golden and an inserted skewer (put in just off centre to avoid Biscoff) comes out clean! Leave to cool in the pan for 10 minutes, before transferring to a wire rack to cool completely. Once cool, devour! 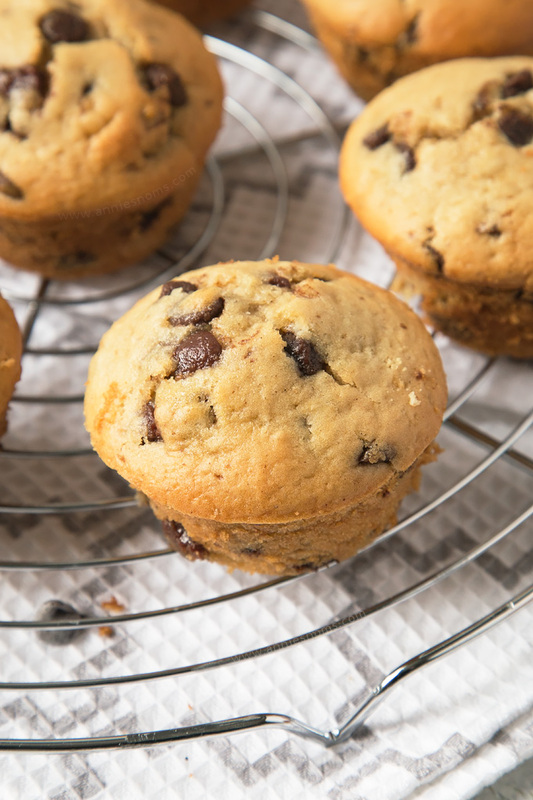 These muffins are great at room temperature, or reheated in the microwave for one minute to soften the Biscoff centre. Biscoff filled Chocolate Chip Muffins will keep in an airtight container, at room temperature, for 5 days. That is quite the decadent breakfast. Even better for dessert. Yum! You have just made my perfect muffins! I need to make these ASAP! Ohmigoodness, how wonderful looking…. and unexpected! Im going to pin these for later! 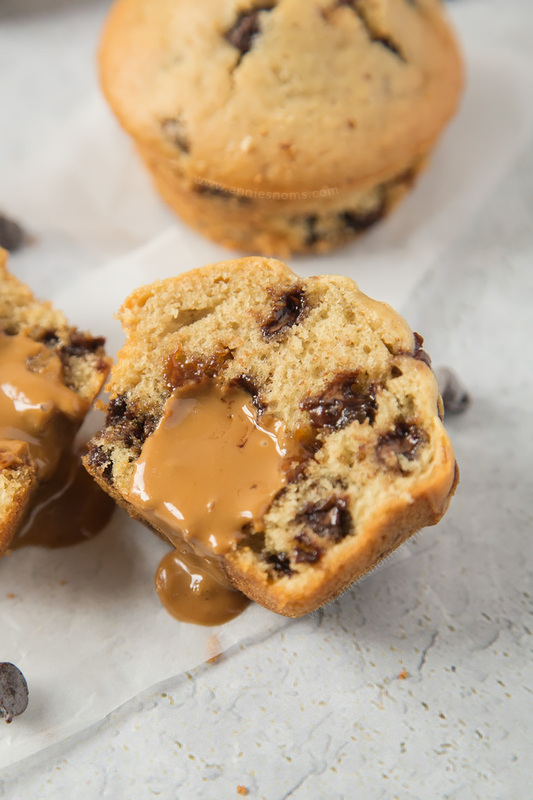 Wow I LOVE filled muffins….these would be great on a brunch menu…or just for me!! Oh my gosh, Annie…that last picture with the filling? PERFECTION. 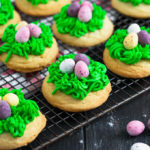 Must must make these! These muffins look incredible, Annie! LOVE Biscoff! I need to make these! I’ve still never used biscoff! This makes me want to though. I’m honestly so in love with it now. I went for ages without trying it, but now I can’t get enough! I eat the Trader Joe’s version of Biscoff (I actually like it better) straight from the jar, so I’d go bonkers for these muffins! 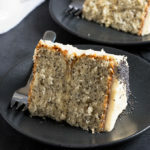 I agree with you on the people who don’t give credit when slightly modifying a recipe! That is one thing that really burns my cookies! We don’t get Trader Joe’s here, but I’ve heard so many good things about their cookie butter! Ugh, I know right? But what can you do if they’re not copying and pasting your content exactly! ?… but you know 100% they changed like 1 ingredient from your recipe and called it theirs and they’re even copying the way you set your shots up?! So infuriating!! YUM!! That is an awesome surprise inside 🙂 I could easily devour 2 or 3 of these. These muffins looks AMAZING !! 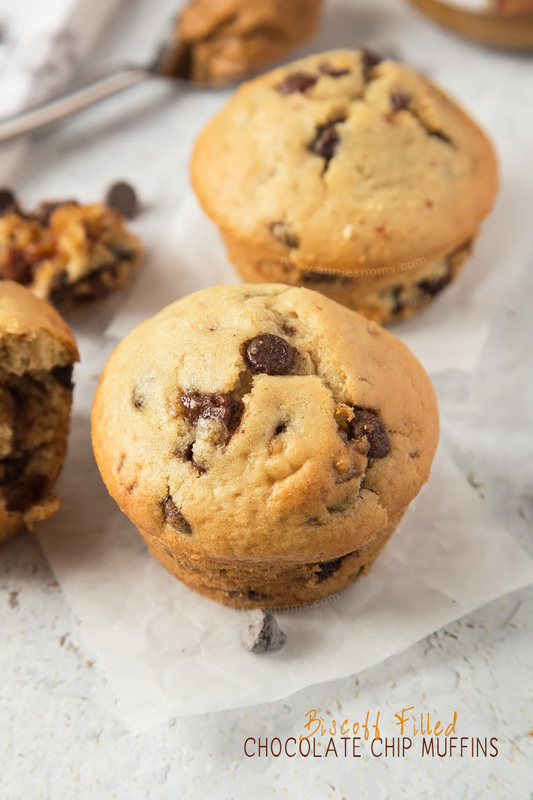 Chocolate chip muffins are the best choice ever! They can be prepared in the short time and they are tasty and choco. Thanks!